The fancy tri-tone paint finish took 260 hours to complete. Unlike Ferrari and Aston Martin, McLaren didn’t debut any new models at this year’s Geneva Motor Show. 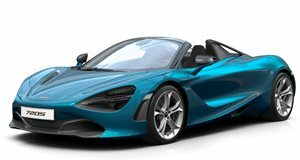 Instead, the automaker is showcasing a special one-off example of the 720S Spider designed by its MSO personalization division with a striking color scheme that highlights the car’s aerodynamic attributes and customization possibilities. Each aero accent features a blend of three MSO metallic paints: Cerulean Blue, Abyss Black, and Burton Blue – the latter was used on the McLaren 720S GT3. This innovative tri-tone paint finish, which McLaren calls "Coriolis”, is an advancement of a technology applied to the McLaren 720S Velocity by MSO shown at Geneva two years ago. According to McLaren, the paint scheme took 260 hours to complete the tri-tone paint elements, which were applied to individual body panels to emulate the flow of air over the 720S Spider’s aerodynamic body while the car is moving. Parts finished with the tri-tone paint include the front splitter, hood air intakes, front air intakes and side panels, lower door and lower side air intake panels, door mirrors, rear bumper and the underside of the active rear spoiler. These highlights are contrasted with Meteorite Grey body paint, the newest addition to the MSO Bespoke range of exterior colors, as well as 10-spoke Super Lightweight forged wheels in a MSO Bespoke Abyss Black gloss finish and MSO Bespoke Burton Blue brake calipers. "Aerodynamic innovation is such an integral part of the 720S Spider that using this new paint design to highlight areas that work hard to manage how air flows over the car – literally how the car ‘breathes’ – was the natural approach to take. This is a car that truly merges artistry with the science of aerodynamics,” said Darryl Scriven, MSO Chief Designer. Other custom exterior features include a gloss carbon fiber tonneau cover, carbon fiber diffuser and B-pillars. The one-off McLaren 720S Spider diffuser is also fitted with a sports exhaust, Stealth Pack and electrochromic glass for the panel of the retractable hard top. Inside, the bespoke treatment continues with a cabin trimmed in specially developed Burton Blue Alcantara and Jet Black leather. All primary and secondary interior components are carbon fiber, and there’s also the option of exposed visual carbon fiber for the Monocage II-S structure. Like its hardtop sibling, the McLaren 720S Spider is powered by a 4.0-liter twin-turbocharged V8 engine that produces 710 horsepower and 568 lb-ft of torque. This enables the convertible Super Series to accelerate to 62 mph from a standstill in 2.8 seconds before topping out at 202 mph with the roof down and 212 mph with the top up. There’s a point where Dr. Jekyll and Mr. Hyde comparisons give way to “this car can just do it all.” This is that point.